, the eldest son of sir William Davenant, was born in 1656, and was initiated in grammar-learning at Cheame in Surrey. Though he had the misfortune to lose his father when scarce twelve years of age, yet care was taken to send him to Oxford to finish his education, where he became a commoner of Baliol college in 1671. He took no degree, but went to London, where, at the age of nineteen, he distinguished himself by a dramatic performance, the only one he published, entitled, “Circe, a tragedy, acted at his royal highness the duke of York’s theatre with great applause.” This play was not printed till two years after it was acted; upon which occasion Dryden wrote a prologue, and the earl of Rochester an epilogue. In the former, there was an apology for the author’s youth and inexperience. 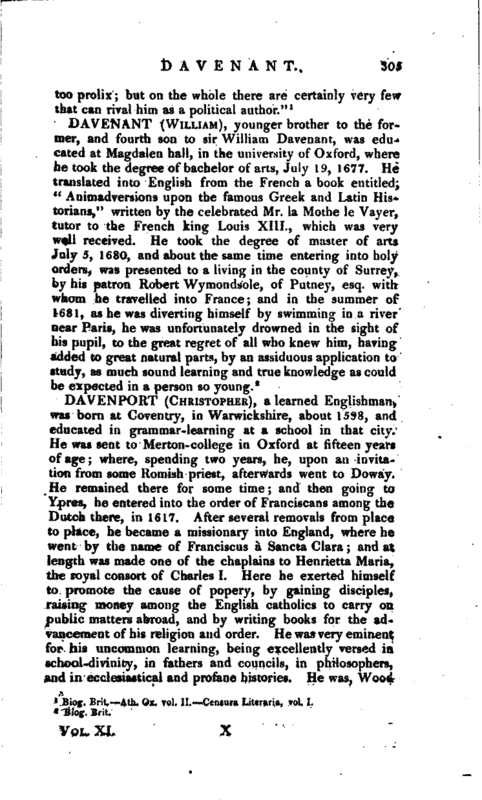 He had a considerable share in the theatre in right of his father, which probably induced him to turn his thoughts so early to the stage; however, he was not long detained there | either by that, or the success of his play, but applied himself to the civil law, in which, it is said, he had the degree of doctor conferred upon him by the university of Cambridge. He was elected to represent the borough of St. Ives in Cornwall, in the first parliament of James II. which was summoned to meet in May 1685; and, about the same time, jointly empowered, with the master of the revels, to inspect all plays, and to preserve the decorum of the stage. He was also appointed a commissioner of the excise, and continued in that employment for near six years, that is, from 1683 to 1689: however, he does not seem to have been advanced to this rank before he had gone through some lesser employments. In 1698 he was elected for the borough of Great Bedwin, as he was again in 1700. He was afterwards appointed inspector-general of the exports and imports; and this employment he held to the time of his death, which happened Nov. 6, 1714. 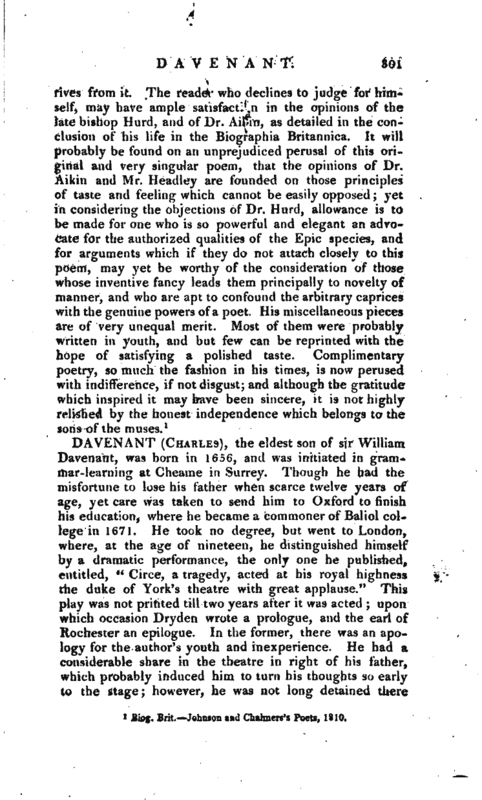 Dr. Davenant’s thorough acquaintance with the laws and constitution of the kingdom, joined to his great skill in figures, and his happiness in applying that skill according to the principles advanced by sir William Petty in his Political Arithmetic, enabled him to enter deeply into the management of affairs, and procured him great success as a writer in politics; and it is remarkable, that though he was advanced and preferred under the reigns of Charles II. and James II. yet in all his pieces he reasons entirely upon revolution principles, and compliments in the highest manner the virtues and abilities of the prince then upon the throne. His first political work was, “An Essay upon Ways and Means of supplying the War,” 1695. In this treatise he wrote with so much strength and perspicuity upon the nature of funds, that whatever pieces came abroad from the author of the Essay on Ways and Means, were sufficiently recommended to the public; and this was the method he usually took to distinguish the writings he afterwards published. 2. “An Essay on the East-India Trade,” 1697. This was nothing more than a pamphlet, written in form of a letter to the marquis of Normandy, afterwards duke of Buckinghamshire. 3. “Discourses on the public revenues, and of the trade of England. Part I. To which is added, a discourse upon improving the revenue of the state of Athens, written originally in Greek by Xenophon, and now made English from the original, with some historical notes by another hand,” 1698. This other hand was | Walter Moyle, esq. who addressed his discourse to Dr. Pavenant. 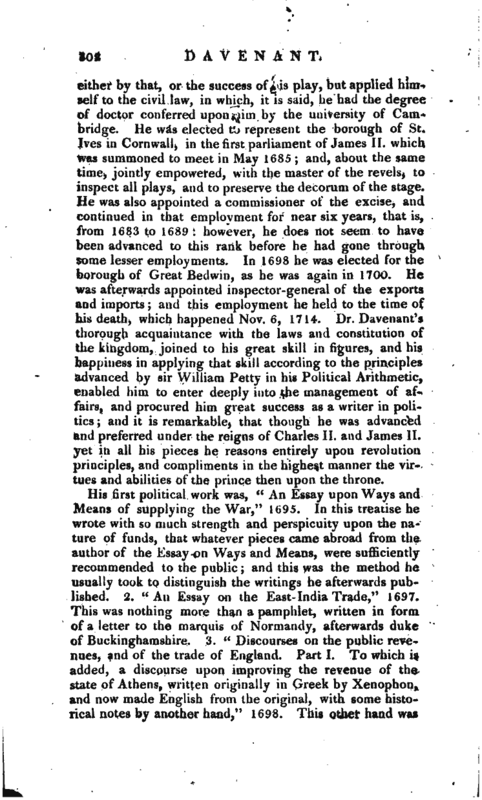 There is a passage in it which shews, that there were some thoughts of sending over our author in quality of director-general to the East-Indies; and is also a clear testimony what that great man’s notions were, in regard' to the importance of his writings. 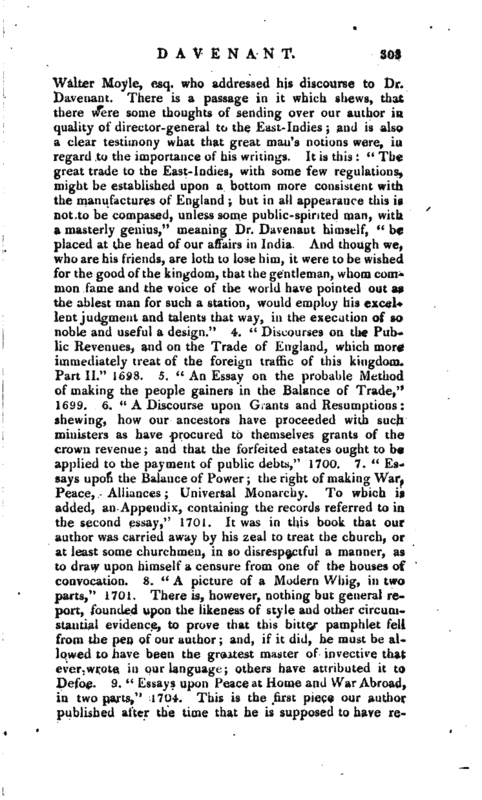 It is this: “The great trade to the East-Indies, with some few regulations, might be established upon a bottom more consistent with the manufactures of England; but in all appearance this is not to be compased, unless some public-spirited man, with a masterly genius,” meaning Dr. Davenant himsrlf, “be placed at the head of our affairs in India. And though we, who are his friends, are loth to lose him, it were to be wished for the good of the kingdom, that the gentleman, whom common fame and the voice of the world have pointed out as the ablest man for such a station, would employ his excellent judgment and talents that way, in the execution of so noble and useful a design.” 4. “Discourses on the Public Revenues, and on the Trade of England, which more immediately treat of the foreign traffic of this kingdom. Part II.” 1698. 5. “An Essay on the probable Method of making the people gainers in the Balance of Trade,” 1699. 6. “A Discourse upon Grants and Resumptions: shewing, how our ancestors have proceeded with such ministers as have procured to themselves grants of the crown revenue; and that the forfeited estates ought to be applied to the payment of public debts,” 1700. 7. “EsMiys upon the Balance of Power; the right of making War, Peace, Alliances; Universal Monarchy. To which is added, an Appendix, containing the records referred to in the second essay,” 1701. It was in this book that our author was carried away by his zeal to treat the church, or at least some churchmen, in so disrespectful a manner, as to draw upon himself a censure from one of the houses of convocation. 8. “A picture of a Modern Whig, in two parts,” 1701. There is, however, nothing but general report, founded upon the likeness of style and other circumstantial evidence, to prove that this bitter pamphlet fell from the pen of our author; and, if it did, he must be allowed to have been the greatest master of invective that ever wrote in our language; others have attributed it to Defoe. 9. “Essays upon Peace at Home and War Abroad, in two parts,” 1704. This is the first piece our author published after the time that he is supposed to have | reconciled himself to the ministry; it was suspected to be written at the desire of lord Halifax, and was dedicated to the queen. It drew upon him the resentment of that party, by whom he had been formerly esteemed, but who now bestowed upon him as ill language, or rather worse, than he had received from his former opponents. 10. “Reflections upon the Constitution and Management of the Trade to Africa, through the whole course and progress thereof, from the beginning of the last century to this time,” &c. 1709, fol. in 3 parts. 11. “A Report to the honourable the Commissioners for putting in execution the Act, entitled, an Act for the taking, examining, and stating the Public Accounts of the Kingdom, from Charles Davenant, LL. D. inspector-general of the exports and imports,” 1712, part I. 12. “A Second Report to the Honourable the Commissioners,” &c. 1712. 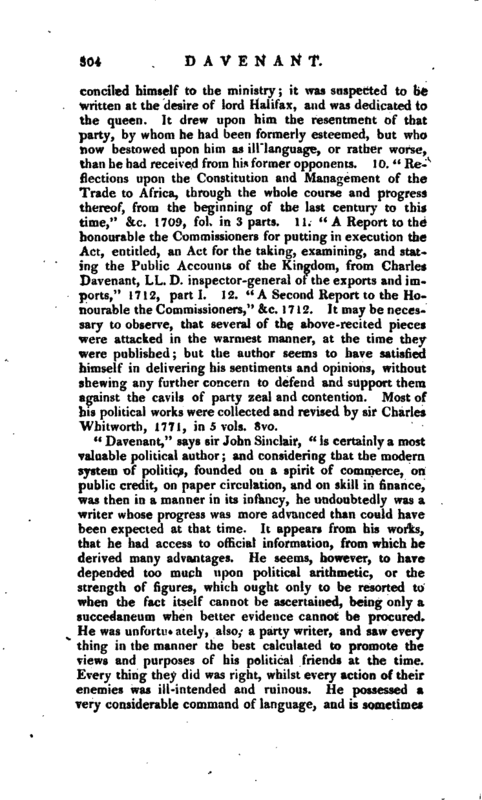 It may be necessary to observe, that several of the above-recited pieces were attacked in the warmest manner, at the time they were published; but the author seems to have satisfied himself in delivering his sentiments and opinions, without shewing any further concern to defend and support them against the cavils of party zeal and contention. Most of his political works were collected and revised by sir Charles Whitworth, 1771, in 5 vols. 8vo. Biog. Brit. —Ath, Ox. vol. II. Censura Literaria, vol. I.